After a sudden complication of heart disease, Vera received her “Angel Wings” at Midland Care Hospice in Topeka, KS surrounded by her loving family Sunday, January 13, 2019 shortly before 6:00 A.M. Vera was 81. Vera Emelia was born to Alvin Gottfried and Florence Jessie Mann on July 16, 1937 in Larimore County, Colorado. She graduated from Mohave County Union High School in Kingman, AZ in 1956. She and Dennis John Dragonas were married on June 10, 1957 in Kingman, AZ. This union was blessed with four beautiful children: Diana, Norene, Brenda, and Dennis (DJ). They later divorced. Vera moved to Cottonwood Falls in 1968 with her four children. 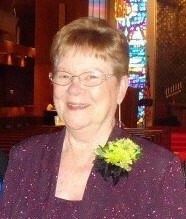 She was a member of the Cottonwood Falls United Methodist Church. She worked as a bookkeeper for Shorty Peach and as a tax preparer for Pool & Sinnard CPA, during the annual tax season for several years. Vera drove an over-the-road truck for several years and was in every state of the union except Alaska and Hawaii. She even transported one of the space shuttles. She served as the City Clerk of Cottonwood Falls for over 15 years and was a proud member of the League of Kansas Municipalities. After her retirement Vera attended many games, plays, and sporting events at the high school taking “gate.” She was a member of the Chamber of Commerce and active at the Senior Center as a server before her health declined. She was a regular at the Senior Center and enjoyed the good food and wonderful friendships she made through the years. Vera loved to create beautiful things and one of her passions was crocheting blankets, hats, and booties for premature babies. Over the years she made hundreds of these gifts of love. Another passion Vera had was maintaining her fitness. Every Monday and Wednesday, her family knew they could find her at All In Fitness Training Center in Cottonwood Falls with her physical fitness trainer, Jerod Barrett. Other members of her class included Eula Barrett and Melinda Barrett. Vera is survived by her son, DJ (Christy) Dragonas of Americus; her daughters: Diana (Mike) Lauer of Cottonwood Falls, Brenda Wessel of Cottonwood Falls and Norene Carroll of Emporia; eight grandchildren; 11 great-grandchildren; her sister, Nettie (Joe) Pherigo of Augusta; and her brother, Alvin (Judith) Mann of Mammoth, AZ along with many relatives and friends. She was preceded in death by her parents and brothers: Ora, Richard, Garold, and Billy Mac Moffett. There will be no visitation. A celebration of life memorial service will be held Friday, January 18 at 11:00 A.M. at the Cottonwood Falls United Methodist Church. Her children will scatter her cremains over the Hualapai Mountains near Kingman, AZ at a later date. Memorial contributions to the Chase County Senior Center or Midland Care Hospice may be sent in care of Brown-Bennett-Alexander Funeral Home, PO Box 220, Cottonwood Falls, KS 66845. Online condolence messages may be left at www.brown-bennett-alexander.com or Brown-Bennett-Alexander Funeral Home on Facebook.